Sorry, but our focus is on the 5 core areas (regions) listed above. However, if you are a corporation, municipality, have a sizable collection in mind or if you have collected with us before, please click here. Yes, I have an organization I would like to submit for review. No, I would like to have Second Chance Toys find me a recipient organization. I have read and agree to the terms and conditions to be eligible to collect donations of Second Chance Toys. Please note: Donated toys may be used on site or given directly to the children. 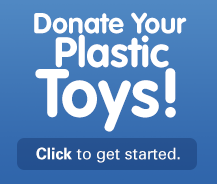 Donated toys may not be sold or used in any way for monetary gain.